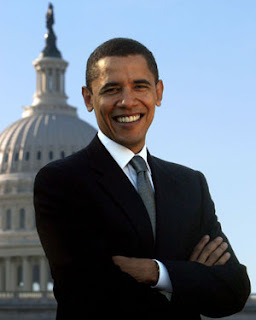 Stella's Musings: President Obama has an Indian Connection! So, you are an ardent fan or a sworn enemy of the US president Barak Obama and you think you know everything about him, do you? Well, here is something you don't know: Barak Obama is a citizen of India and resident of a village near Hyderabad. Don't believe me? Well, there is proof - a local mobile phone number registered in the name of Mr Obama. Yes, a couple of weeks ago, this cell phone number - +9177523297 - was assigned by Airtel (that is one of India's largest cell phone service providers) to a Mr Barak Obama after he filled up an application form that had a photo of, who else but Obama himself? According to the form, Obama, however, is 21 year old and is a resident of a village called Nalgonda in Andhra Pradesh state.Interesting, isn't it? Sadly though, the media came to know about it and kind of blew it up into a big controversy. It wrote how the form was actually filled up by a certain Mr Prasad with Obama's photo pasted on it and how the mobile company never bothered to question that because all it wanted was to sell a new subscription. Hmm , if you ask me, this is the greatest gesture of displomacy and fair trade. I mean, c'mon, why should anyone not do business with an American president? Better still, why should a mobile company official say 'no' to an American president? So he did what he thought was only fair: assign the no. God bless his soul; now we Indians could get in touch with Obama so easilly: just dial a local number! Unfortunately, the higher authorities in that mobile company were a little less believers who cancelled the subscription. Then came the police and they went a step further, booking both Prasad - the person who signed the form and the Airtel salesman who accepted it. Sad end of the story, but now you know Obama is a man with an Indian connection even if lasted for a week!